For the past eight years I have been driving the checkers and baggers (not to mention the customers standing in line behind me) at my neighborhood Jewel crazy by bringing my own shopping bags and packing as many groceries into my backpack as I could fit in there. It shouldn't have been that big of a deal, but I guess it interrupted their routine and as much as they may care about the environment, they care more about finishing their shift as quickly as possible and going home. 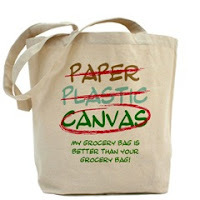 Today, the woman in front of me reached over and grabbed three of the canvas bags they sell in the checkout line and bought them to bag up her groceries, and the woman behind me already had her canvas bags with her. I guess that means it's hip now.